Class: Junior Hometown: Lexington, Ky.
NOTES: One-year letterwinner ... All-PAC honoree ... Was a member of the College's swimming and diving team in 2013-14... Older brothers Adam and Noah both swam for Grove City... 2015: Competed in just two meets due to injury ... 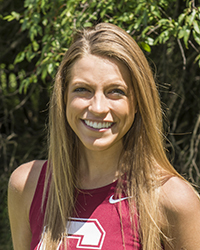 Finished 57th at PAC Championships with time of 27:54.0 in lone 6K race of the season ... 2014: Competed in five races during first season with the program... Ran a 5K time of 21:42 in her first collegiate race at Buffalo State... Earned All-PAC Honorable Mention by finishing 20th at the PAC Championships with a season-best 6K time of 24:54.4.